When hiking out in the wild it’s inevitable that you run into the remains of deceased (and probably eaten) wildlife. Some hikers may be sad to see these signs, but I take it as an indication that the ecosystem is working as it should. In a world of carnivores there is simply going to be carnage. But at the same time, I pause and admire the feathers, or bones, or hair that remains behind and see beauty in what is left. I’m afforded a much closer view than I usually get, since squirrels scamper away as I approach and birds take flight. It’s a chance to admire the colors and textures of skin, hair, feathers, and fur. 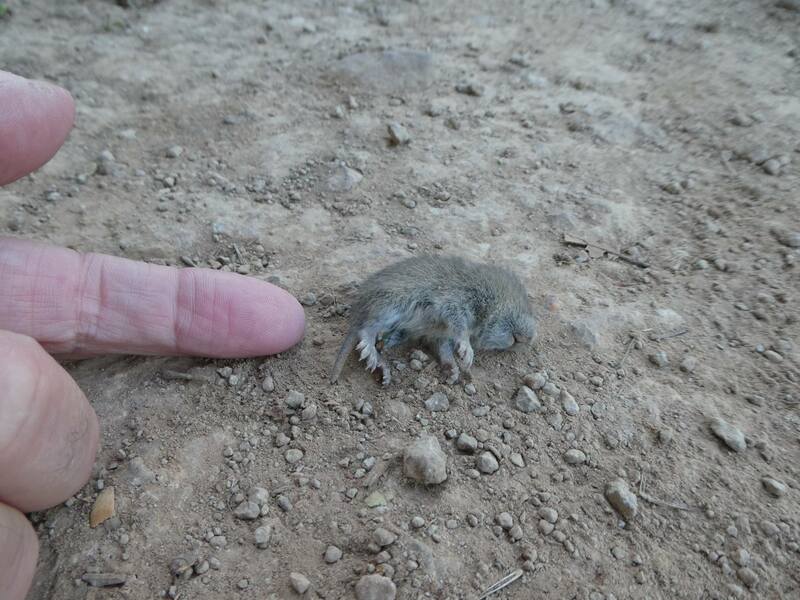 A rare occurrence is to find an animal intact (see photo of a Shrew Mole), and at those times I feel particularly blessed with an opportunity to study it. More frequently, I find the animal mutilated (see photo of the snake) or largely gone (see photo of what was left behind of a squirrel). But I find even the fragments fascinating in their own way, and grateful for the opportunity for close-up inspection. When you are out on the trail, keep an eye out for these sights, and count yourself blessed should you come across a relatively intact wild animal. And if there are only remains, you will know that they fed a predator and are part of a cycle that includes not just a life but also a death that nothing living on this planet escapes. If you’re a reader of this blog you likely know that dogs are not allowed on the Montini and Overlook properties. However, there is one type of canine that is definitely allowed, Canis latrans, or coyotes. 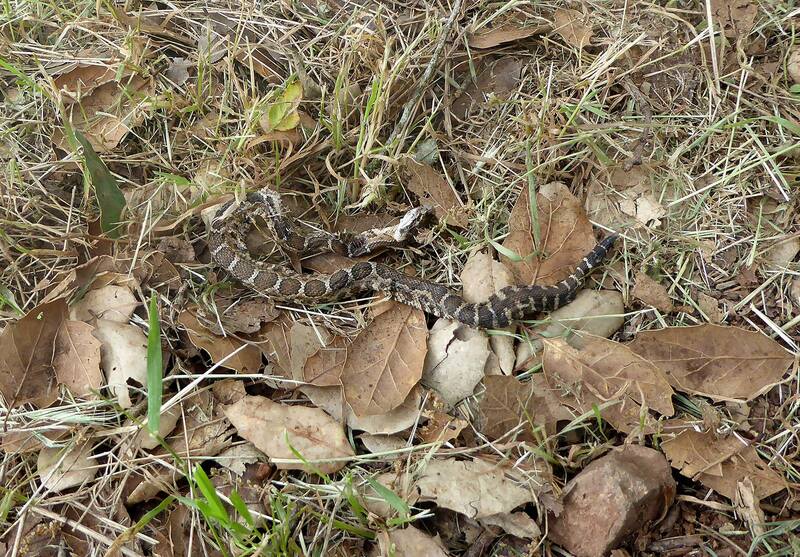 I happened to spot one today out in the meadow below the Holstein Hill trail on the Montini Preserve (see photo). Even if you don’t see a coyote you can often hear them. The other day I was hiking on the Montini Preserve and sirens started going off below me in the town of Sonoma. They were met by howls from above me by a coyote responding to the sirens. They also bark (see the video below of a coyote barking on the Montini Preserve). 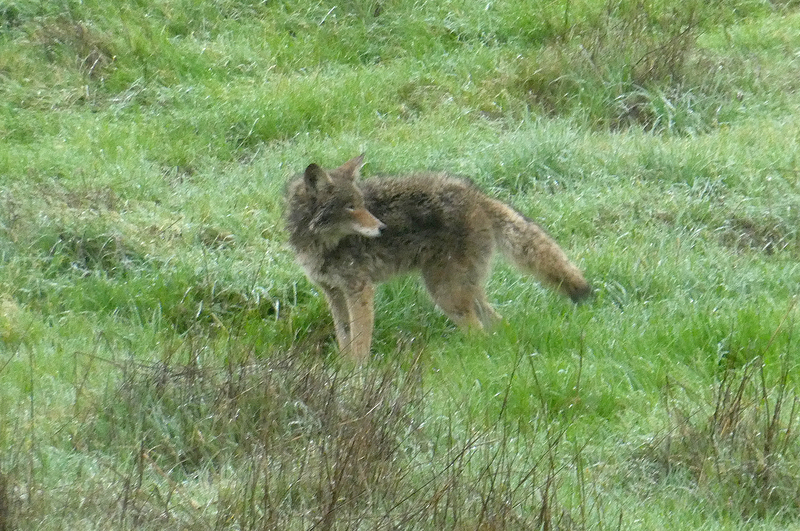 Coyotes are abundant throughout North America, and they thrive in the kinds of mixed meadows and woodlands we have here in Sonoma Valley. They eat small game such as rabbits, rodents, fish and frogs, and deer. They can also consume snakes, insects, and even fruit or grass (but most of their diet consists of mammals). Near humans, they have been known to eat garbage and pet food. Canis familiaris, the domestic dog, is descended from the coyote. So you could say that we owe coyotes quite a bit. Keep your eyes peeled the next time you’re out on the trail, and maybe you’ll be lucky enough to spot one (or hear one). 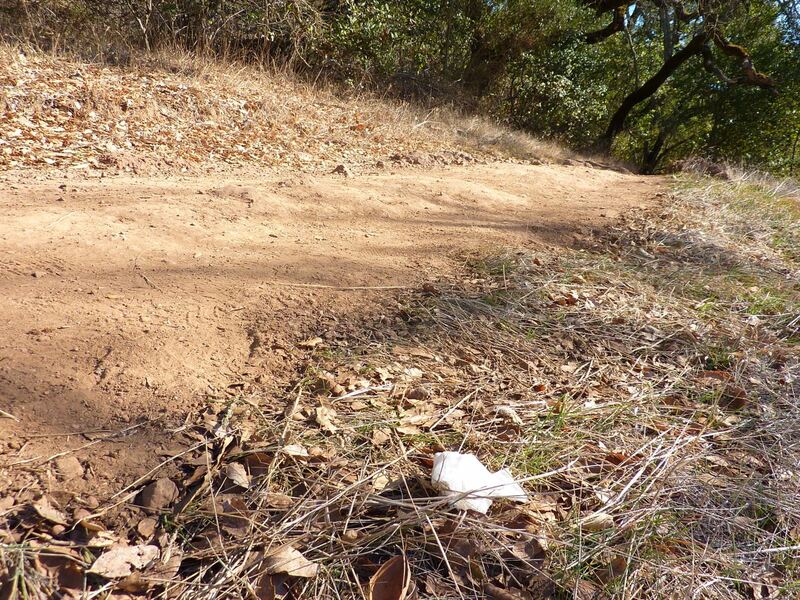 Hike the trail on a sunny winter day and you will instantly feel the happy effects of endorphins as they kick in! If you haven’t been up the trail lately, now is the perfect time to shake off those solstice doldrums and take advantage of our Northern California winter. You’ll be glad you did!